Unimore will play a key role in the development of a European research project aimed at using urban organic waste and waste of the large retail sector for the production of biomaterials. The great ambition of researchers from Modena and Reggio Emilia is to make urban organic waste become food for insects, which will transform it in valuable substances that may be used to make feed, plastic materials or for energy purposes, but also as food ingredients. Known as SCALIBUR (Scalable Technologies for Bio-Urban Waste Recovery), the project has been officially launched in the last few days on the occasion of the kick-off meeting held in Valencia. Professors and researchers of the Department of Life Science and Law are taking part in the project representing the University of Modena and Reggio Emilia: professor Andrea Antonelli (Food Sciences and Technolgies), coordinator of the research unit at Unimore, professors Lara Maistrello (Entomology) and Francesca Masino (Food Sciences and Technologies), Enrico Francia and Anna Justina Milc (Agronomy and green crops), and professors Luigi Foffani (Criminal law) and Silvia Manservisi (Agricultural law). The general purpose of SCALIBUR  professor Andrea Antonelli explains  is to recover and value urban organic waste, waste from the large retail sector, and sewage sludge from the waste water treatment of urban purifiers, to get bio-based products that will be placed back in the market, therefore not only curbing the environmental impact resulting from the waste management, but also creating new richness and job places. Over 100 million tons of organic waste - i.e. about 200 kg per person - are dumped each year in the EU. At present, 75% of them go to landfill or incineration, causing serious environmental issues: organic waste produce gas when decomposing, thus contaminating soil and groundwater. The landfilling of biodegradable waste goes against the principle of a circular economy, being also a waste of nutrients and energy. SCALIBUR aims to help manage this issue. 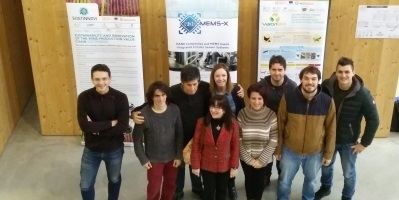 Coordinated by ITENE (Instituto Tecnológico del Embalaje, Transporte y Logística) in Valencia, Spain, the project involves 21 partners throughout 9 countries. Financed within the scope of Horizon 2020, with a budget of nearly 10 million euros in total, a large part (802.995,00 euros) will go to the Unimore research group and will be used by the Department of Life Sciences, in collaboration with the partner company Kour Energy Srl, for the realisation of a pilot plant aimed at obtaining high-added value substances from insects that will be mass bred in the plant made thanks to the recently closed ValoriBio POR-FESR project. He is in charge of WP5. He is a food technologist involved in food innovation and food production sustainability. He is also well-experienced in food quality, food analysis and study of the volatile fraction. He has collaborated to Italian projects focused on viticulture and winemaking sustainability, as well as on the use of insects in a circular economy perspective.